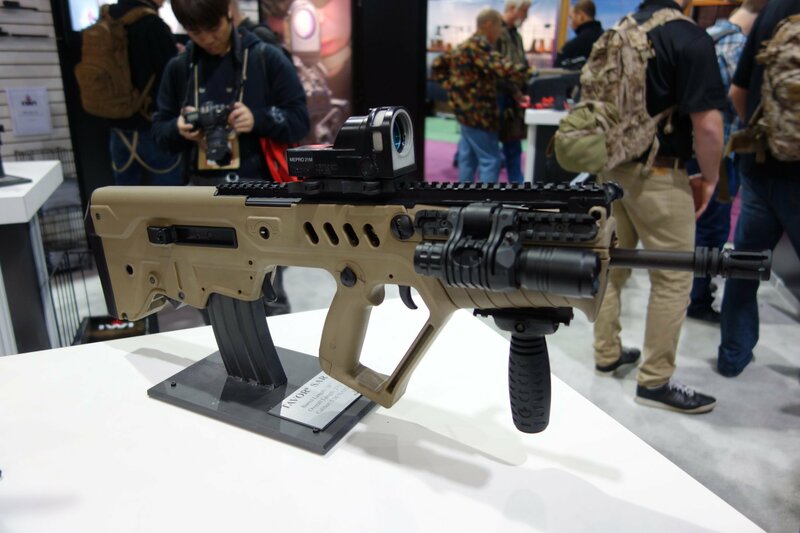 Israel Weapon Industries IWI TAVOR SAR Bullpup 5.56mm Tactical Carbine/Rifle Series: IWI TAR-21 Goes Semi-Auto-Only, Civilian-Legal and into US Production! (Video!) | DefenseReview.com (DR): An online tactical technology and military defense technology magazine with particular focus on the latest and greatest tactical firearms news (tactical gun news), tactical gear news and tactical shooting news. 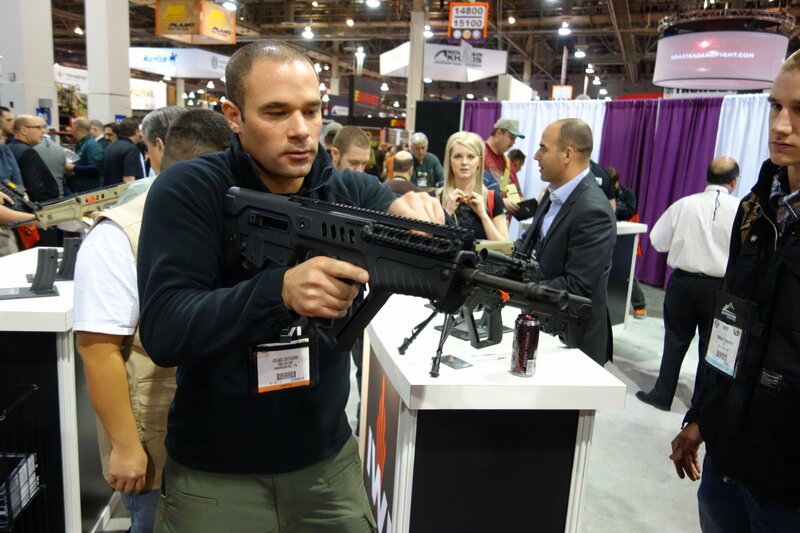 The Israel Weapon Industries (IWI) TAVOR SAR 5.56mm NATO (5.56x45mm NATO)/.223 Rem. 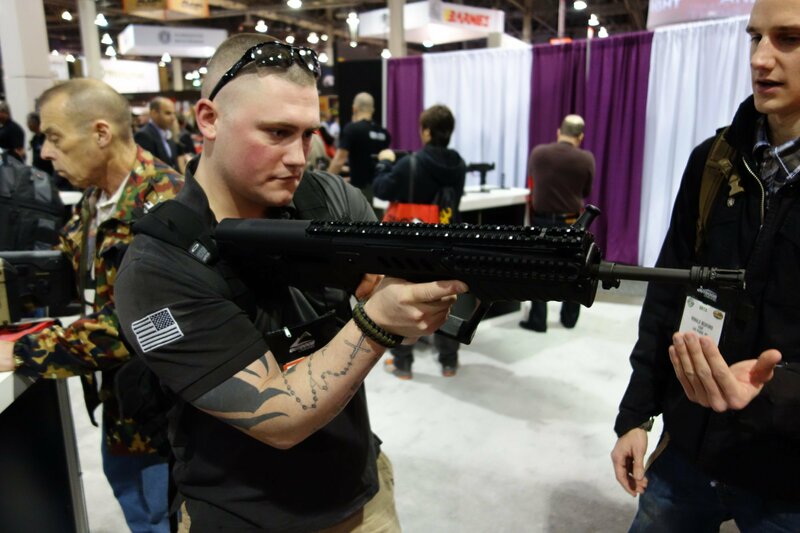 bullpup tactical carbine/rifle (series), the semi-auto-only, civilian-legal version of the military-grade IWI TAVOR TAR-21 select-fire/full-assault rifle/carbine, was one of the hottest new items DefenseReview (DR) saw, handled and fired at SHOT Show 2013. 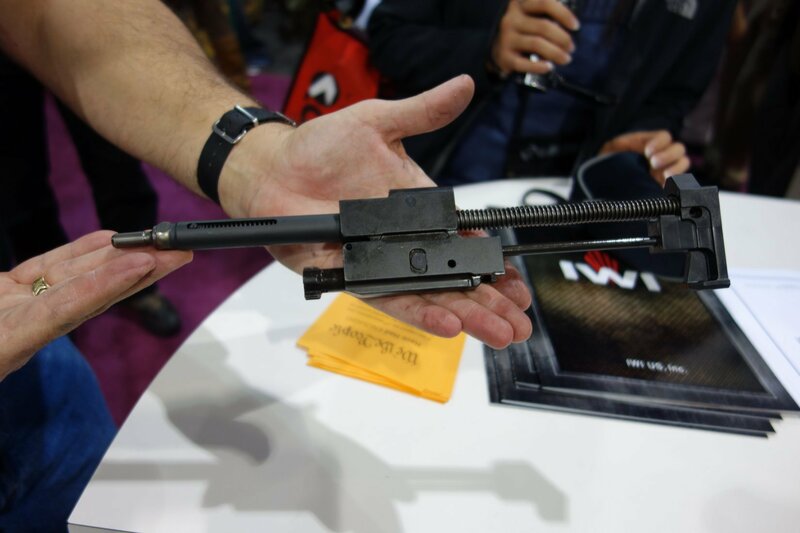 It generated A LOT of interest both at Media Day and at the IWI booth during the exhibition, particularly because it's now in U.S./domestic production–finally! DR actually first fired the IWI Tavor TAR-21, IWI X95 Rifle/Carbine / Micro Tavor MTAR-21 SBR (Short Barreled Rifle)/sub-carbine (and IWI Negev Commando belt-fed LMG/SAW) on full-auto and semi-auto at the 2008 NDIA Infantry Small Arms Systems Symposium Firing Demo and we came away from that experience pretty impressed. The IWI Tavor SAR semi-auto-only tactical carbine is also pretty cool, but now that we're used to high-end combat/competition triggers (Geissele Automatics, JP Enterprises and JARD triggers, to name a few) on tactical ARs (AR-15 carbines), we're a bit jaded over here, and we found the TAVOR SAR's trigger to be a little heavy and clunky at the range. 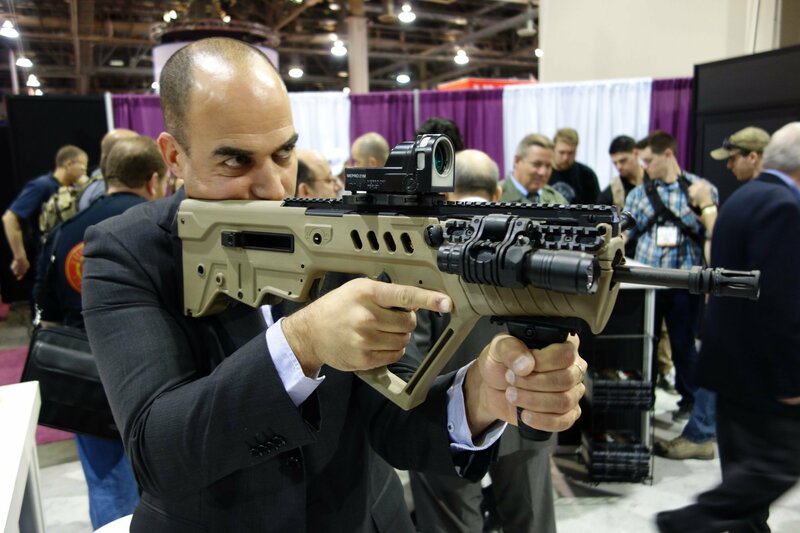 Bullpup triggers are generally a bit problematic to begin with, so it's doubtful the folks at IWI will be able to approach a high-end AR combat trigger action for the Tavor, but perhaps they can dial the Tavor SAR's trigger in a little better on the production models. It would certainly aid precision shooting, double-taps and triple-taps, especially during fast multiple-target engagements and shooting against moving targets. As of this writing, nothing really beats a high-end tactical AR with a correspondingly high-end trigger for fast accurate shooting and multiple-target strings. 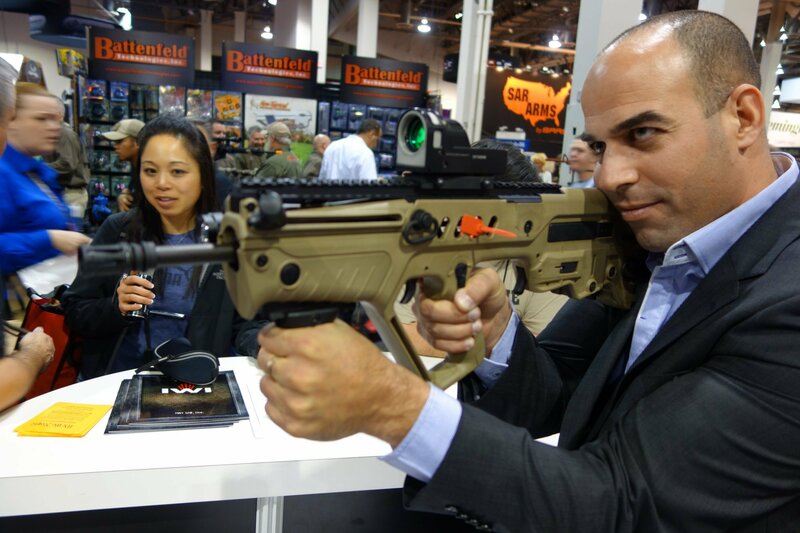 It will be interesting to see if high-end triggers can be developed for the Tavor SAR series. While we're used to the AR-15 carbine's balance, DR does see the advantage of the IWI TAVOR SAR bullpup's rear-balance/center-of-gravity aspect, easing one-handed operation/shooting, moving and carrying. The weapon's rear balance also enhances multiple-target engagement speed. We also appreciate the bullpup's raison d'etre, it's comparative short length combined with equal-or-greater barrel length for optimized mobility and muzzle velocity/range in a compact package. You can run a 20-inch (20") barrel on a Tavor SAR rifle/carbine and still match or beat the length of a 16-inch (16") barreled AR. The IWI Tavor SAR series comes standard with a 16" barrel, which makes it significantly shorter, more compact than a tactical AR/M4/M4A1 Carbine. 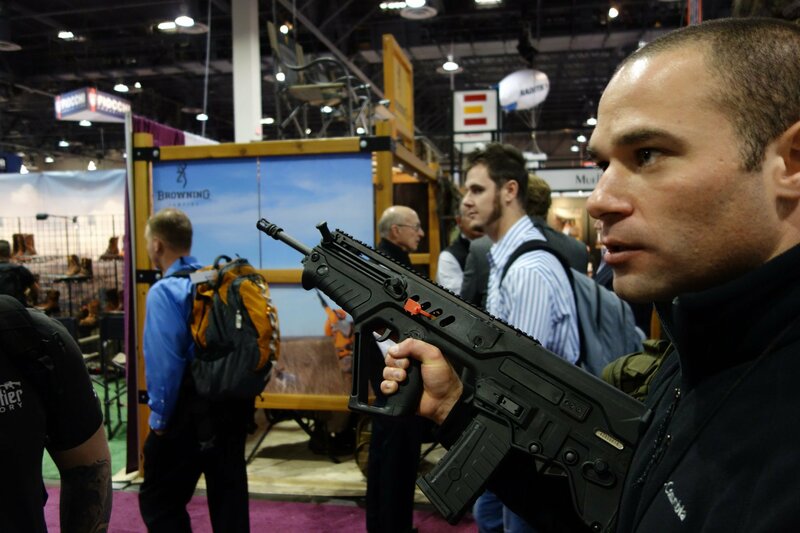 Assuming the TAVOR SAR works as advertised and is reliable, accurate and durable under adverse conditions at high round count, the only real caveat DR has is the operating controls difference and associate retraining aspect vs. the AR platform. 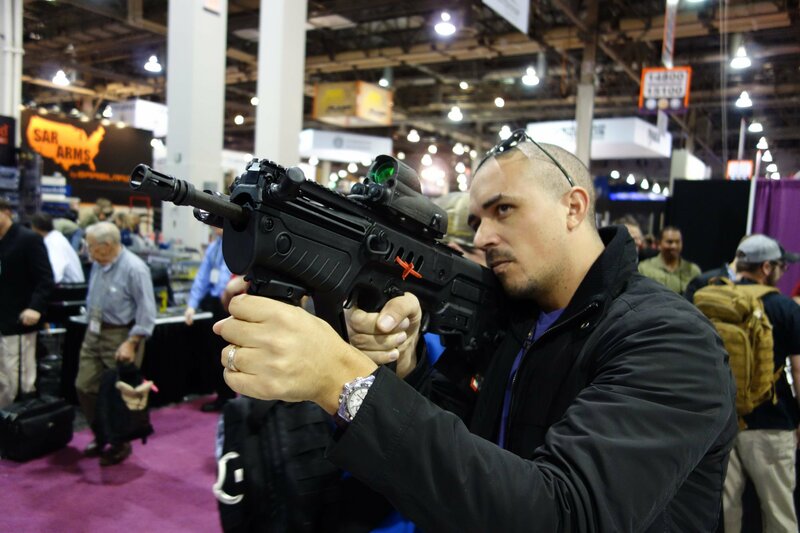 However, once an operator acclimates to the bullpup design and Tavor's control layout specifically, the weapon's ergonomics are good, and speed reloads/mag changes (magazines changes) can be accomplished very quickly, certainly quickly enough for dynamic CQB/CQC (Close Quarters Battle/Close Quarters Combat) and general infantry combat applications. The Tavor's controls are ambidextrous, so lefties and righties can accomplish all weapon-opertional tasks with equal aplomb. The rifle also comes with a full-lengh Mil-Std-1913 "Picatinny" top rail and quad-rail forend for mounting combat optics/sights, lasers, vertical foregrips, etc. The top rail sports integrated front and rear flip-up BUIS (Back-Up Iron Sights), which is a nice touch. Editor's note: In the third/bottom video, below, notice the demonstrator's and first-time user's actuation of the thumb-actuated manual bolt release button behind the magwell after inserting a fresh 30-round mag. This is an important aspect of the Tavor's manual of arms and reloading speed. 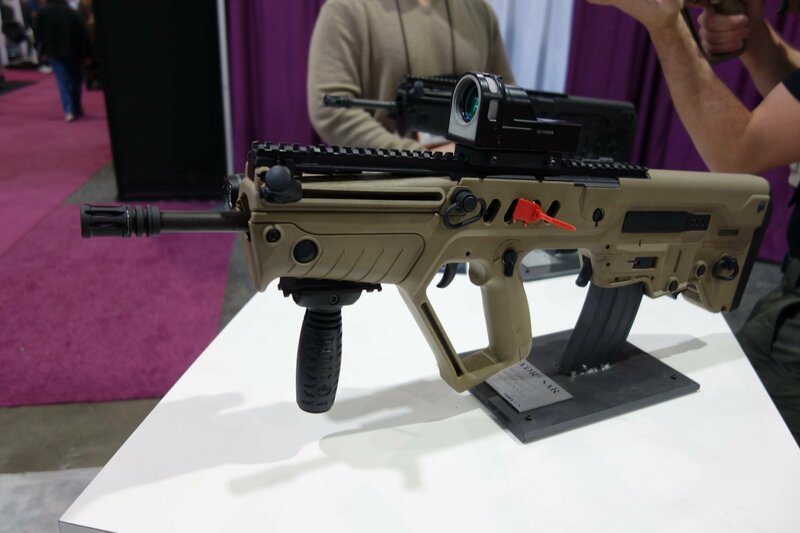 The Israelis have designed a nice little weapons package, here, and it will be a very welcome addition to the American tactical/defense rifle market. Defense Review likes this gun. 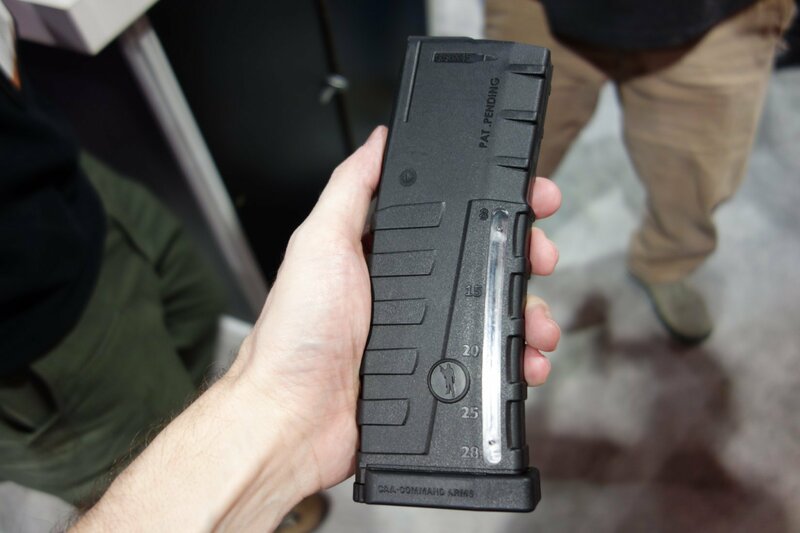 By the way, the Command Arms (CAA) MAG-17 Clear Action Mag with window indicator and standard MAG (no window) 30-round mags look pretty good, but DefenseReview has never tested them or even run them at the range, nor have we received any military assaulter/operator feedback on them, so we have no idea how reliable and/or durable they are. 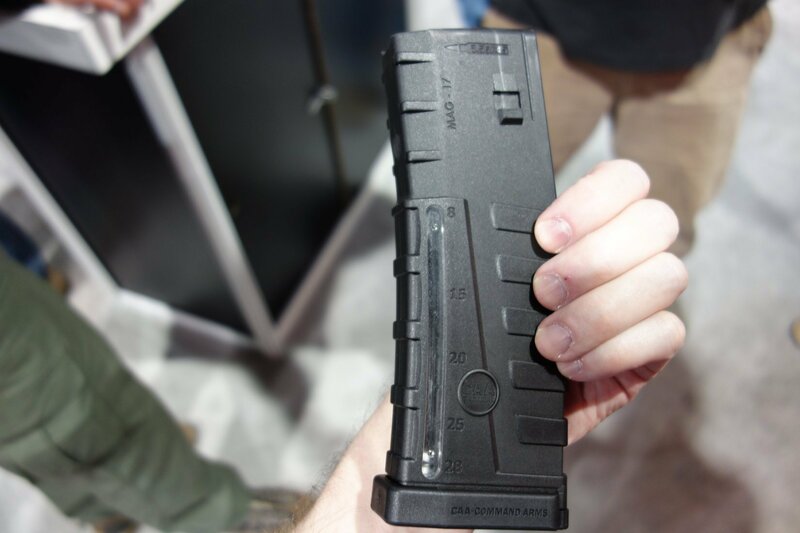 However, since it would appear that the CAA mags are going to be the IWI factory-supplied mags for the TAVOR SAR carbine series, it would seem logical that the company has tested them and is satisfied with their performance (unconfirmed/unverified). At the end of the 1982 Israel-Lebanon War arose an understanding that the modern battlefield had changed. One of the conclusions from the war, particularly relevant to the small arms industry, was that the battle had moved from open field conflicts to close-quarters engagements – and there was a need for a seamless transition from daylight to nighttime capability on a single mission. Out of this understanding, and after more than a decade of collaboration and testing with the Israel Defense Forces (IDF) – the TAVOR® rifle was born. Just as race car technology trickles down to consumer automobiles, so do these time and battle-tested firearms now become a modern sporting rifle platform for civilian gun enthusiasts. The TAVOR® is a perfect fusion of an ordnance grade steel receiver coupled to a Mil-Spec cold hammer forged barrel and encased into a high-impact strength polymer uni-body with exceptional situational ergonomics. The ultra-compact form factor allows for easy transitions in close quarter situations…or even in your favorite deer blind. 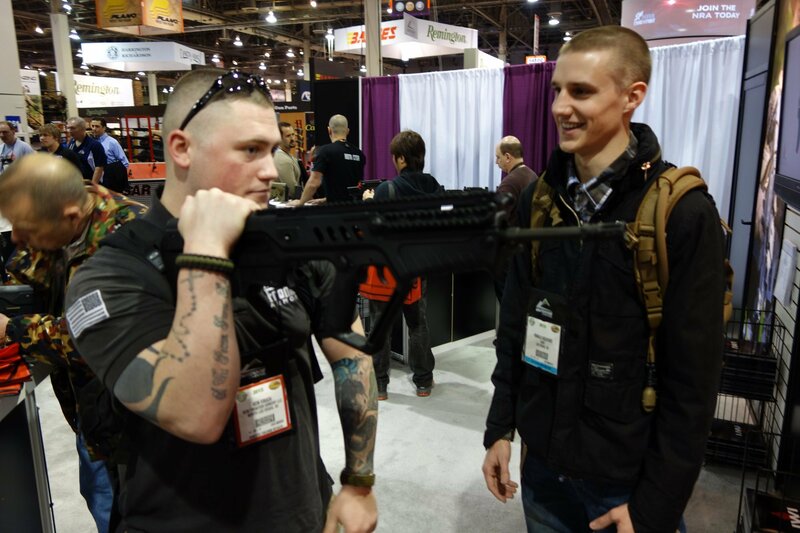 The bullpup design moves the center of gravity of the rifle closer to the users’ body allowing for more instinctive aiming and improved acquisition time to target. This innovative design also allows for a full length barrel, which means no loss of down range ballistic accuracy. Near and far range accuracy is enhanced by the minimized recoil provided by a non-lubricated long stroke gas piston system. 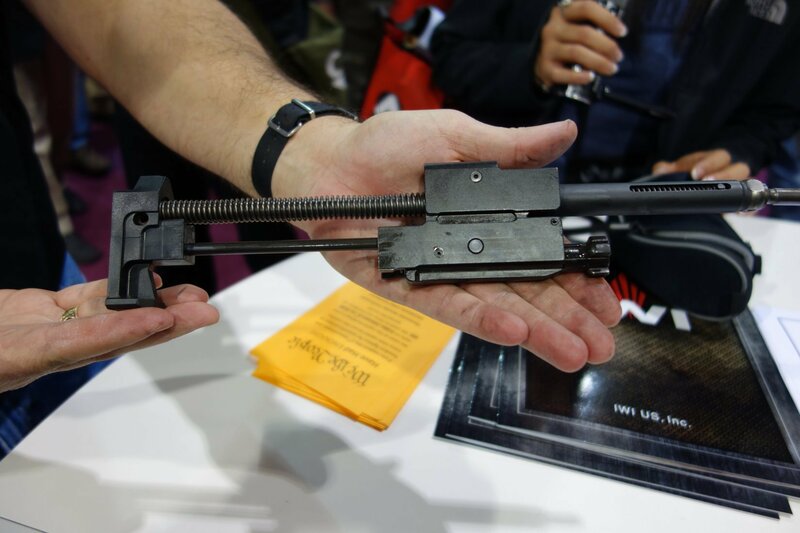 With the exception of a hand-specific locking bolt, the rifle is completely ambidextrous allowing for easy left-hand conversion of the operating handle, ejection port, fire-control safety, sling swivel receptacles and fore-mounted accessory Picatinny rail. The TAVOR® is supplied with IDF-tested and approved magazines – but you can also use your own AR-15/M16 style magazines. – Body constructed of high-strength impact modified polymer"
Israel Weapon Industries IWI ACE 52 7.62x51mm NATO “Assault Rifle” Battle Rifle for Military Infantry Special Operations Forces (SOF): Coming to the Commercial Market for Civilian Tactical Shooters?